In this fast-paced world we live, having an escape space in the home is important for our mind, body and soul. If having a luxurious and soothing retreat in your home to recharge every morning (or evening) sounds like a refreshing idea, you might consider a master bath remodel. We have a couple of trend setting ideas to ponder as you create your new oasis. Large, multi-head tiled showers and freestanding tubs are at the top of our must-have list. The industry is seeing less of the bulky built-in jet tubs with tile or marble surrounds and more large, spacious showers paired with jaw-dropping tile. Today, tile options alone are a reason to sway your decision toward a large walk-in shower. Tile planks (which can mimic wood), scalloped tile shapes, pattered tiles — the tile world is your oyster, literally. Pair the tile with your favorite plumbing fixture finish and multiple head options and enter paradise. 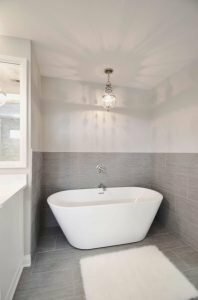 For those clients who are still interested in keeping a tub for relaxation or even as a focal, Decker recommends installing a freestanding tub. The unique sculpture adds shape and a focal point to the master bath. Styles of freestanding tubs range from modern to chic. A large, white, curvaceous tub with claw feet can add a touch of vintage and softness to a bathroom that is otherwise transitional in style. Is your home trending toward a modern design? Consider a tub with sharp angles or a dramatic sloped back. Pair your tub selection with the proper tub filler in a complimentary finish. Lighting, an often-forgotten design feature, will add to the impact of a freestanding tub. Depending on the function of your tub, a chandelier overhead provides task and ambient light. Additionally, a skylight or window nearby allows for an open and natural feel. Finish off the spa-like sanctuary by styling with a wooden tray or small side table to hold a candle or glass of wine or six. These are obviously just a few of the to-date trends to consider when creating a spa-like bathroom. If you would like to renovate or just need direction and advice on design, or even how or where to get started, contact Decker at ACo at 317-575-9540 ext. 107 or liveaco.com.